The fall is a great time for cooking and eating, creating new recipes and bringing back old ones. Having a well organized kitchen is crucial for good meal planning and preparation. Making optimal use of the space in your kitchen is more important when you’re spending extra time creating new recipes and making some of fall’s favorite comfort foods. Of course, every kitchen is different. Some are sprawling with plenty of open cabinet space to fit every appliance and gadget on the market. Others are tiny and tight without an inch to spare. However, many of the same rules apply when it comes to organization. Here are a few tips to keep your kitchen in tip top shape. Maximize every inch of cabinet space. Somehow we always find a way to fill up every inch of cabinet space no matter how big or small our kitchen is. Make use of containers, and organizational items inside your cabinets to make the best possible use of space. Lazy Susan’s, helper shelves and drawer dividers will not only help to keep things organized, they will also help you fit much more. Shop Wisely. If you have a tiny galley kitchen, you shouldn’t be shopping at Costco. When you live in a smaller space, you have to make frequent trips to the grocery store. Don’t purchase in bulk unless you have somewhere to keep the excess. Often the deal is not worth compromising your space over. If you do purchase extras, consider storing them separately so you don’t have three boxes of the same cereal circulating. Make use of vertical space. 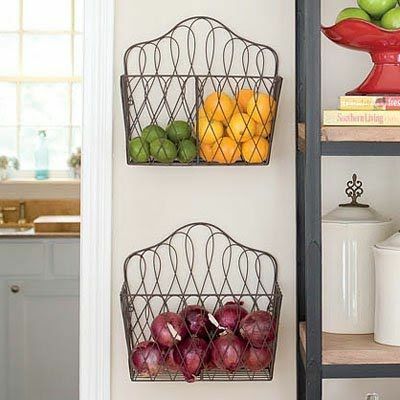 If you have available wall space in your kitchen, add a fruit basket on the wall (see image) or free standing shelving. Also remember to keep frequently used recipes and notes on the inside of cabinet doors. Consider a Hanging Pot Rack. If you don’t have great space for keeping pots and pans in cabinets or drawers, make use of a hanging pot rack. It makes them easy to access and frees up cabinet space. Refresh your Fridge. Every time to shop, your fridge should get a once over. A simple weed out of stale food and a wipe down of shelves will make incoming items accessible and more appealing too. Keep your Freezer Functional. Your freezer is great for storage of items that can be used for meal preparation rather than heading out to the market. Don’t forget to label, date and properly package items in the freezer so you know what you have and when it expires. Keeping an organized kitchen will help make meal preparation more efficient. It will save you money on purchasing groceries and will help to ensure you enjoy mealtime with your family.